Camping and boating have come a long way in the last few years. Not too long ago, if your campsite wasn’t close to a public rest area or an RV, you’d have to dig a hole to do your business. If your boat or RV didn’t come with its own restroom, you’d have to hold it until you made it back to dock. Thankfully, now there are portable toilets that make the whole process much easier and more convenient. Many are relatively small and easy to clean. But which is the best portable toilet to buy? We looked at a number of outdoor and traveling porta-potties and rounded up the top five. Here’s what you need to know. 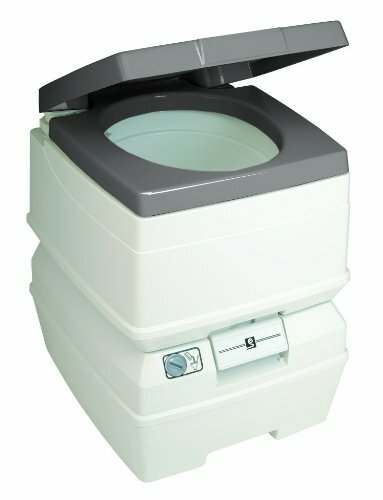 The Camco 41545 Travel Toilet is one of the best travel toilets on the market today. Not only does the flushing mechanism and toilet height mimic the indoor toilet you’re used to, it also has a nice dark beige color that keeps it from drawing too much unwanted attention. Of course, at its core, this is a toilet, and the experience isn’t going to be super pleasant, but Camco has done their best to make this the most user-friendly emergency toilet you can buy. There is a clean-water tank for flushing as well as a “used” tank that will hold your waste material. These tanks are very tightly sealed, which locks in odors and keeps things from leaking. This might seem like a minor consideration, but if your toilet ever falls over, you’ll be thankful for the added sealing power. This toilet also comes with a sample pack of deodorizing/cleaning chemicals, which help to contain any extra scents and make it easier to clean. These chemicals are not considered environmentally safe, so if you’d like to leave your waste in the woods, you’ll need to buy those separately. The biggest complaint with this particular model is that it may be a bit uncomfortable for taller users, but we found that this issue was easily fixed by using bungee cords to attach it to a base. Camco also offers a 2.6-gallon size as well as a “standard” model, but we feel that the 5.3-gallon Premium model is the best value for the price. If you’re looking for a portable toilet that’s even closer to your home toilet, the Thetford 92360 Porta Potti 550E Curve or Theford 2.6 gallons Portable Potty are an amazing choice. This unit uses a battery-powered flushing mechanism which helps to keep the bowl cleaner (as long as you put a bit of water in the bowl before using it for solid waste). 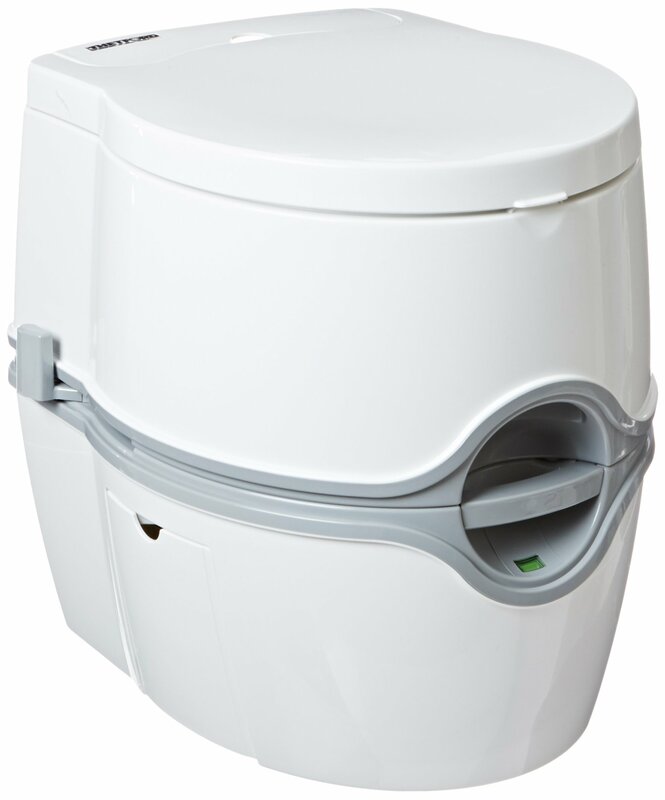 The Porta Potti comes with everything you need to get started, including a set of batteries and a trial-sized bottle of Thetford’s deodorizing chemicals. If your batteries happen to die while you’re out on the trail or on the water, you can manually flush by using the side lever and a separate water source, as the batteries are only used to draw water from the clean tank. 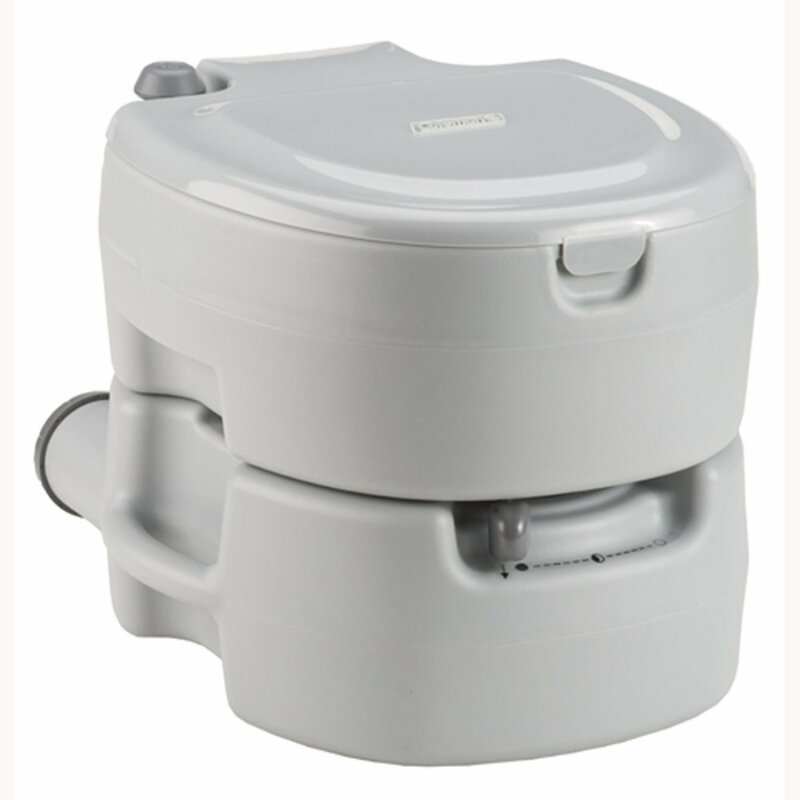 As with the Camco Travel Toilet described above, the freshwater and waste tanks are easily separated for refilling and dumping, but seal securely when snapped into place. Each tank has a separate indicator that will let you know when it’s time to refill the fresh tank and when it’s time to dump the waste tank. The included instructions aren’t the greatest, but it is pretty simple to figure out on your own. We did notice that the batteries that come with the unit are a bit weak – upgrading them for better batteries will give you better water pressure and a much cleaner bowl. Overall, with any electric unit, there are bound to be problems not present in manual flush toilets. 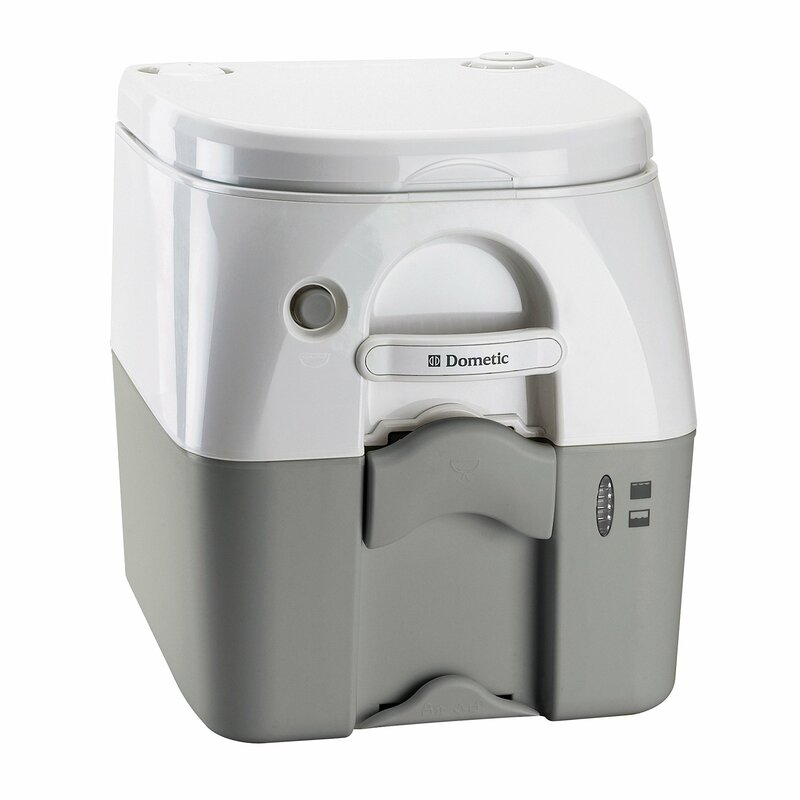 For those looking for a highly portable toilet that will tuck away out of sight when not in use, the Dometic 301097606 Portable Toilet is an excellent, compact choice. Even with the large 5-gallon waste tank, this will easily fit into your RV’s closet or shower area for a “spare” bathroom. t is a bit shorter than the previous units on our list, so those who need something closer to the size of a “real” toilet might opt for one of the larger models. Additionally, we felt that their claims of an “adult-sized seat” may have been a bit exaggerated – the entire toilet is quite small compared to some of the others on the market. Aside from the small size (which is both an advantage and a disadvantage), our biggest complaint is that clipping the two tanks together requires precision, and there is no easy way to tell if you have them lined up properly. This wouldn’t be much of a problem, but if they’re not aligned, the toilet will leak all over the floor. Thankfully, we haven’t noticed any issues with the waste tank leaking, but it still needs noting that this may not be the best choice for use in an RV or closet, despite the small size. A smaller (2.6-gallon) unit is also available if it will only be used by a single person for a one-to-two-day excursion. 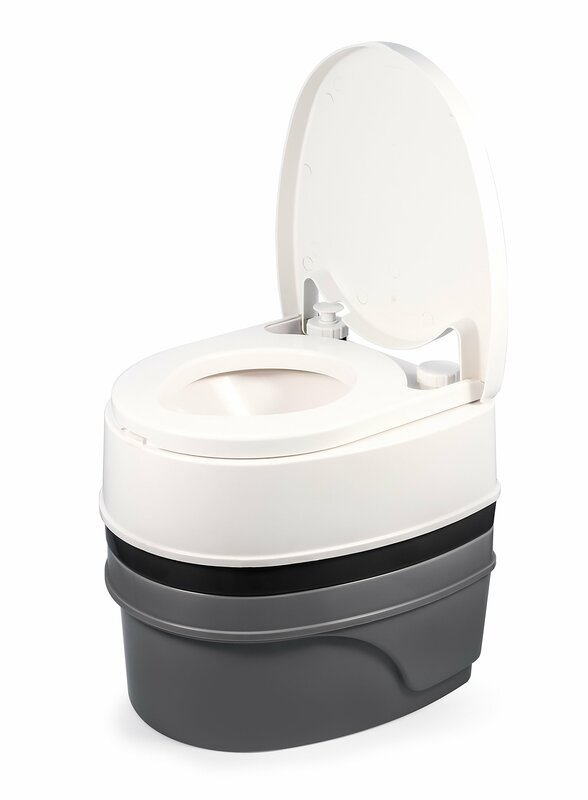 If you absolutely need a small portable toilet and don’t mind sacrificing a bit of the convenience of a larger tank, the Sanitation Equipment Passport Potty 2 gallon(8-Liter) portable toilet is a solid choice that feels sturdy when used by the average-sized adult or child. Larger adults may find that it’s a bit too low, and the weight limit may be an area of concern – we tried with an adult up to 225 lbs. with no problems, but your experience may vary. One of our favorite things about this Passport Potty is that there are so many different sizes available – perfect to fit any need. Whether you need something that’s under a foot tall (the 2 gallon version) or something with a larger holding tank or anything in between, this Passport Potty is sure to have an option that fits your individual preferences. Coleman is one of the leaders in the camping industry, so it makes sense that they would have their own portable toilet as well. Enter the Coleman Portable Flush Toilet. This unit comes in both a “regular” (3.5-gallon) and “large” (5.3-gallon) size. The regular is just right for one person for a few days, but we recommend the large size, as it comes much closer to the “feel” of a regular, full-sized toilet. This has a normal seat on it that will accommodate even larger-sized adults with no problems. Our biggest complaint with this unit is that the top and bottom pieces are a bit difficult to screw together, partially because of the large footprint. Those who don’t have long arms will probably need to cradle the whole toilet to screw the parts together. Additionally, we found that the waste tank leaked a bit when carrying for dumping unless it was carried level – not by the handle. Overall, it is one of the less expensive options on our list, and for those who really need a full-sized toilet seat, this is one of the best. When it comes to portable toilets, more expensive is not necessarily better for your needs. The higher-priced toilets might have features that you don’t even care about, or they may have a larger size than you reasonably need. Pay close attention to your budget, and don’t spend more than you need to. The largest-sized toilet is not always better. If you’re camping or boating by yourself, you won’t need anything too big. If you have your whole family with you, you’re probably going to want something big enough that it doesn’t need to be dumped every time it’s used. Additionally, your toilet will have a weight limit, so it’s best if you choose one that will hold your heaviest camper with ease. Generally, you’ll want to empty your toilet out every day or two, or even more frequently if it doesn’t have a tight odor-blocking seal. You’ll want a toilet that’s light enough to carry away from any trails or water sources to dump, if you’ll be using it for camping. For those using it in a boat or horse trailer, you’ll want something that comes with mounting brackets to keep it securely on the floor. For emergencies and use in winter cabins, you’ll want a waste tank that’s large enough to hold a few days’ worth of waste, so you won’t need to empty it as often. Your individual needs may vary, so be sure that you’ve done your research. You won’t be able to use harsh chemicals to clean your toilet when you’re in the great outdoors, so it’s best if you get a toilet with a slick inner surface. This helps keep waste from sticking and makes the task of dumping it into a hole much less unpleasant. It also helps to keep the odors from lingering after the toilet has been dumped. You should always thoroughly clean your toilet after you return home from your trip. While we’d like to be able to trust the word of the manufacturers, they may sometimes misrepresent information to make their product sound better than it actually is. By reading reviews from previous customers, you’ll have an idea of the true pros and cons of each toilet you’re comparing. There is rarely such a thing as a perfect product, but you should find one which doesn’t have any unreasonable downsides. Before you start using your new toilet for the first time, it’s best to read the manual if one is included. Generally, the process will be fairly similar across different manufacturers, and varies only based on the type of toilet you’re looking at. Since we’re looking at flushing models today, we’ll address how to use those. Flushing travel toilets are built for convenience. Most come around a 5-gallon size, which will let you use it several times before it needs to be emptied. If your toilet has a slick inner surface, it will prevent waste matter from sticking to the sides. You may also choose to use a powder-coated gelling agent, which will neutralize the odors in solid waste and make liquid waste easier to transport. If you’ll be using a bag liner or a gelling agent, you’ll need to make sure it’s environmentally-safe, otherwise you’ll need to take your waste out with you when you leave the campsite or dock. Using the toilet itself will be very similar to your toilet at home, although they generally don’t come with any form of privacy. If you would prefer to be discrete, a privacy tent (or a clearing between bushes) can help keep you sheltered from the open wilderness. You’ll want to make sure the toilet is far enough away from your sleeping tent that the odors won’t disturb you or attract animals and insects. Any toilet paper you use should be biodegradable as well, otherwise your waste will need to come home with you to dispose of properly. It’s important that you keep sanitation in mind with your toilet, as you may not have access to running water for your hands. It’s a good idea to keep a bottle of hand sanitizer near your toilet to clean your hands after use or cleaning. A disinfectant should be kept nearby as well, particularly if multiple users will be using the same toilet. And, most importantly, never store any of your toilet supplies near your food source – you don’t want to risk cross-contamination and foodborne illnesses! I had no idea that there were even toilets like this. I’ve always seen the big portable toilets at big outdoor events, but little things like this actually feel like they’d be pretty effective if you’re going camping or something along those lines. I can see the benefits of the big ones at events, and these ones other times. I’ll have to keep my eyes open the next time I’m headed out into the wilderness. Thanks for sharing! Just bought domestic loo on line. Don’t love the way the two tanks connect ..fidly . Seems you have to pump it 15 times (noisy) for every flush. Hi,me and my family are planning for camping and we are trying to find a portable toilet to use. and my father-in-law is a arthritis patient so looking for something comfortable for him looking for a portable toilet that is not so costly but comfortable I’m very much concern about odor and stability of a portable toilet. Is there a specific type that might be better for a trip and arthritis patient as well?